With its fascinating coloring and delicate curling arms, the blue-ringed octopus may be a beautiful creature, but this small cephalopod is also deadly. The blue-ringed octopus appears grey or beige with light brown patches when it is at rest, but when agitated its 50 or 60 bright blue rings appear and pulsate with color, as a warning. Inside the salivary glands of the blue-ringed octopus live colonies of bacteria that produce tetrodotoxin, the potent neurotoxin found in pufferfish and other animals. A bite from a blue-ringed octopus can completely paralyze and kill an adult human in a matter of minutes. There is no known antidote. The octopus itself is not affected at all by the toxin-an evolutionary prerequisite for the symbiotic relationship that has developed between the blue-ringed octopus and the toxin-producing bacteria. The blue-ringed octopus is commonly found in shallow, sandy areas surrounding the coastal reefs of Australia and the western Indio-Pacific. It is most active after dark, and spends most of its day hidden in its nest. Like all octopods, the blue-ringed octopus has no skeleton and is thus very flexible and maneuverable. It can squeeze into tiny crevices and make dens in bottles, aluminum cans, or mollusk shells. The blue-ringed octopus is also known to burrow into sand or gravel to conceal itself. Packets of sperm rest in the grooved tip of the male’s modified third arm, called a hectocotylus. When mating, the male slips this grooved tip under the mantle and into the oviduct of the female through a gill slit, and transfers multiple sperm packets, or spermatophores. The female lays her eggs in several unattached clumps, which she carries in her arms until they hatch. After the young emerge from their eggs, the mother dies. 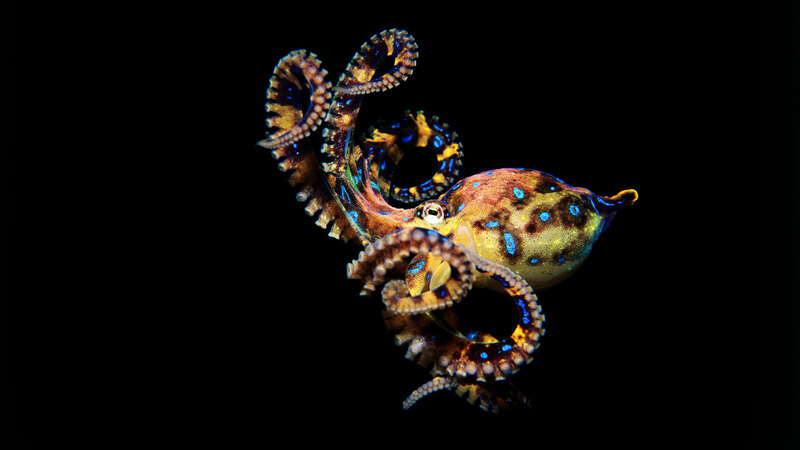 Did you know: The blue-ringed octopus, like all octopuses, has three hearts and blue blood.